If you like the look of fuller lips but aren't interested in permanent or semi-permanent cosmetic procedures, a little makeup can do the trick. Whether your lips lack pigmentation or are naturally uneven — with one side looking bigger than the other or the top lip looking smaller than the bottom — you can use the following tips. 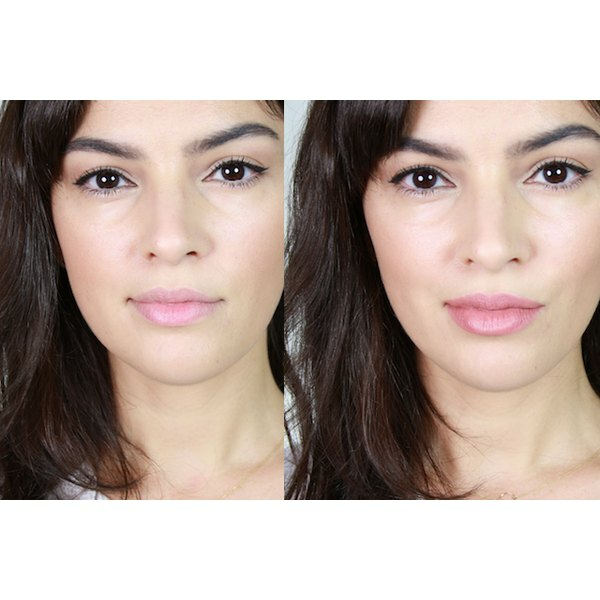 These will help you achieve a fuller and more even lip look, while still looking believable. If your lips are very thin and you want them to appear fuller, avoid dark lip colors and stick with subtle shades for a more natural look. When using makeup to make your lips look fuller, it is important to start with smooth, soft lips. Exfoliate your lips by gently rubbing them with a cotton swab and some lip balm (use a rich, conditioning one). Remove all dead skin (any loose, flaking skin) and then remove excess balm from lips with a clean cotton swab. Your lips should be soft but not greasy or slippery from the balm. Fill in your lips entirely with the lip liner. Cover any lack of pigmentation in your lips. Consistency: Look for a slightly creamy, but not overly soft lip pencil. It should be hard enough to draw a thin, precise line without smudging, but it should not tug your lips. Look for a waxy texture. Color: For a naturally fuller look, find a lip liner that matches your natural lip color or is just as close to it as possible. Begin defining your lip edges by slightly overdrawing them. For a natural, fuller look, go only right over your natural lip contour. Stretch your lips into a close-mouth smile to get better coverage. Make sure to get into the corners of your lips, where many people lack pigmentation. Apply a creamy lipstick or tinted lip balm in a color that matches or is very close to the lip liner color. Dab a tiny amount of highlighter to your cupid's bow (the middle portion of your top lip) to create the optical illusion of extra volume.